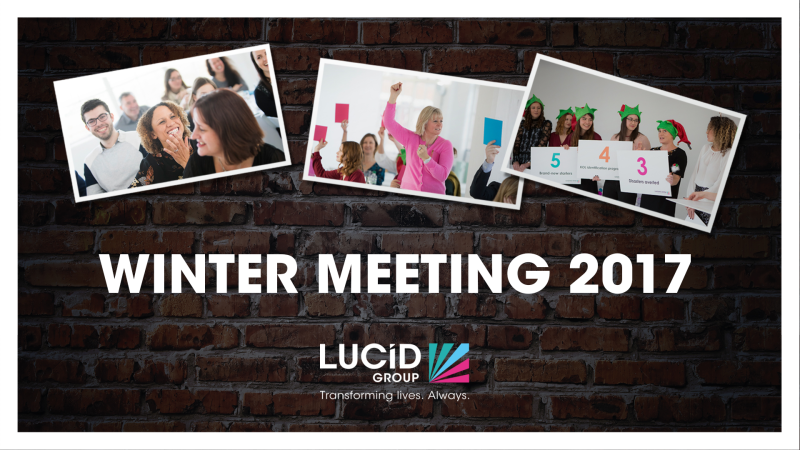 In the frosty sunlight of a winter morning, employees from across the Lucid Group gathered to celebrate a magical year of success at the Lucid Annual Winter Meeting. Traditionally being a day of enchanting celebration, this year’s meeting was no exception. Taking place in a stylish photography studio in East London, the day commenced with a breakfast reception and opening speeches from the founders, Dennis O’Brien (CEO), and Jan Steele (COO), who shared their reflections on 2017 and thoughts for 2018. 2017 has been a spectacular year at Lucid, including winning two PMEA awards, a Communiqué award for Excellence in Communications via Meetings, The Queen’s Award for Enterprise, and launching a new company within the Lucid Group, Vivid MedComms. Each year, the Lucid Winter Meeting is about more than celebrating high-profile achievements, however. It’s the time of the year that the company comes together to celebrate the unique and individual contributions each person has made to Lucid. With this approach, and a good sprinkling of magic, the activities of the day took place. Each team showcased their achievements of the year, with the one caveat of ‘anything but slides’, a marvellous opportunity to demonstrate their creative skills and add some festive cheer. This was followed by individual commitment-setting for 2018 on the Lucid core values of ‘pioneering’ and ‘human-centric’. The meeting ended with the presenting of ‘Excellence Awards’ to those whose achievements this year were exceptional.